The 5650OLP is a Shop Hose Reel we highly recommend for general garage use. This unit will work with Air, Water, Oil, or Grease. 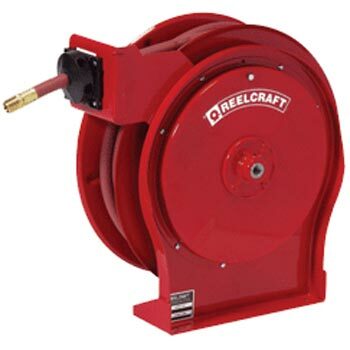 These reels are durable and compact for a wide range of applications. A full throw shaft and swivel assures maximum product delivery. Stress Free Swivel: Reel Craft's full-flow shaft and swivel assures maximum product delivery. Corrosion Resistant: Steel components are individually powder coated to virtually eliminate corrosion. Easy to Mount: Attaches to most structurally sound surfaces. Edges are curved for safety. Enclosed Drive Spring: Drive mechanism is enclosed for protection against the environment. Durable & Compact: Reels are compact for a wide range of applications with critical space requirements. Adjustable Guide Arm: Multiple guide arm positions provide versatile uses and easier field adjustment.